Don't the waiters and waitresses shout, "Ordering!" when they turn in their orders? I guess since many restaurants use computer ordering, this shout-out must be getting obsolete. 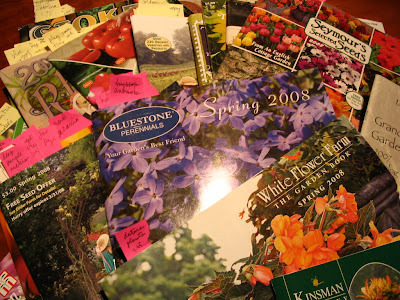 But I feel like shouting it, cuz I have gone through all the catalogs, and have come up with my modest list of seeds for the upcoming season. Nicotiana--maybe my most favorite annual--alata, the white "Fragrant Cloud"--which smells heavenly, and "Favorite Mix" for color; the real california poppy, along with shirley poppy, and of course, 'Cedric Morris' from T & M; datura 'Belle Blanche,' and a tall white snapdragon, for more white; of course, verbena bonariensis, which I'm gonna plant dozens of; moonflower; browallia, which is impossible for me to find in commerce; and the new one for this year [last year it was Laurentia] is lopezia cordata 'Pretty Rose'...Trying once more with a Patty's Plum poppy, too. I have so little room to start seeds, this will take up every square inch. No veggies--I'd just be feeding my bunnies. If I can get it together to fax these in, I'll really feel accomplished! These are the last days when I'm doing Absolutely No Gardening. I'd best enjoy them!